One of the most overlooked pieces of baby furniture, in terms of importance, is the baby swing chair for newborn. First-time parents often neglect to see the important role that such chairs have, especially in the first six to eight months of their baby’s life. Some mistakenly believe them to be unnecessary luxuries, or that they occupy too much space. All of these assumptions are wrong. With the exception of a crib, the baby swing chair is the most useful piece of baby furniture. Babies require love, nutrition, caring and soothing. Parents eagerly offer all of these things to their babies, but can always use the help. 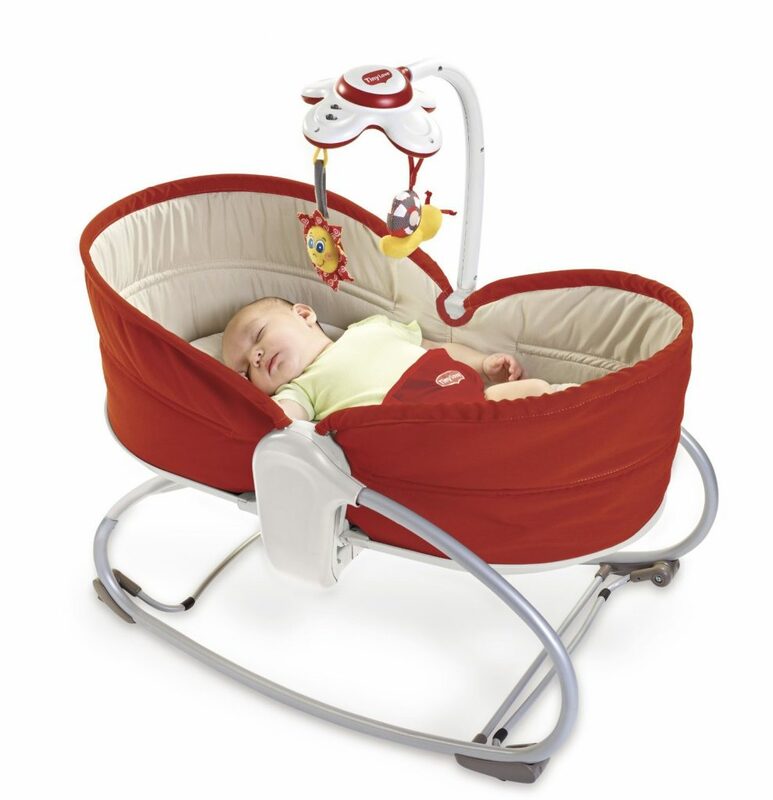 A baby swing chair goes a long way in helping with the challenges of soothing a baby. This is especially true when the baby has other siblings that require the parents’ attention, or simply when the parents need a moment of repose. The rhythmic motions generated by a baby swing emulate the soothing swaying action that babies receive when they are in their parent’s arms. They achieve these sustained gentle motions while using a cradling chair set at an angle. This too emulates the natural position that one would hold an infant for maximum comfort. Babies experiencing colic benefit greatly from this position, staving off further colic caused by gastric reflux. 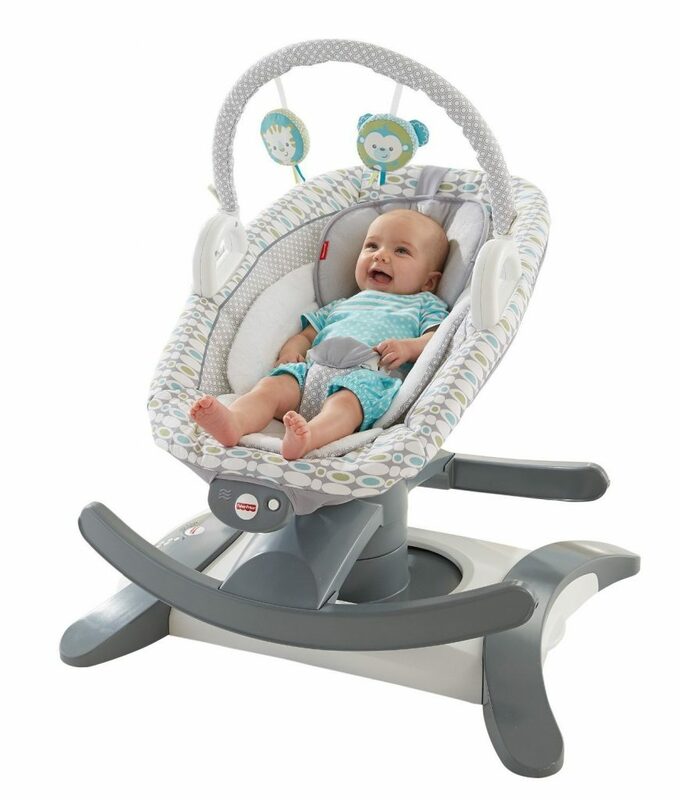 Up until when a baby approaches 30 pounds of weight, the electric baby swing chair is the closest that any parent will come to a reliable baby soothing assistant. Being aware of the practical importance of a baby swing chair is an important first step – knowing about the different types of baby swing chairs that are on the market and what features to look for is the other. As the name implies, this category consists of the largest of the baby swings. Generally, these models can accommodate babies weighing as much as 30 pounds. They tend to have larger footprints in terms of space that they occupy in a room. This can range from 900 to 1,400 square inches depending on the model. The larger size makes them more robust and sturdy. It also allows them to have more amenities such as adjustable swing motion, variable swing speeds, toy bars and speakers for playing soothing sounds and music. Some of these swings have a removable swing seat that can be used as a bouncer too. These baby swings are smaller and lighter than their full-sized counterparts. Maximum baby weights for these models tend to top out at 25 pounds, with most models having a maximum suggested weight of 20 pounds. They are well suited for travel, most having collapsible frames for easier carrying and storage. They can be used as the primary baby swing chair, allowing for easy portability from room to room, or they can serve as a supplementary unit when traveling. Something to consider with portable baby swings is their low-profile. Most models will rest lower to the ground. An issue to be aware of if there are pets or other small children around the house. Hybrid swings combine the functionality of a baby swing, a glider and a bouncer. This makes them more versatile and allows parents to have a full range of comfort and soothing accessories for their baby in one-third of the space. It is important to note, however, that hybrid baby swings tend to be heavier than even some of the full-sized models. If portability is not the main concern, hybrid swings make for a compelling option. What powers the motion of a baby swing is one of the most important features to consider in selecting a model. There are AC powered units that function by being connected to a wall outlet. There are also models that function on batteries, usually D-sized batteries. Some models come equipped with rechargeable battery packs. There are also models that still use a wind-up mechanism. These come with a handle that must be wound up in order to generate 10 to 15 minutes of swinging action. While practical in the sense of its “off-grid” functionality, some parents find that having to wind the chair every 15 minutes inconvenient and impractical, especially if the baby is in the process of falling asleep in the swing. 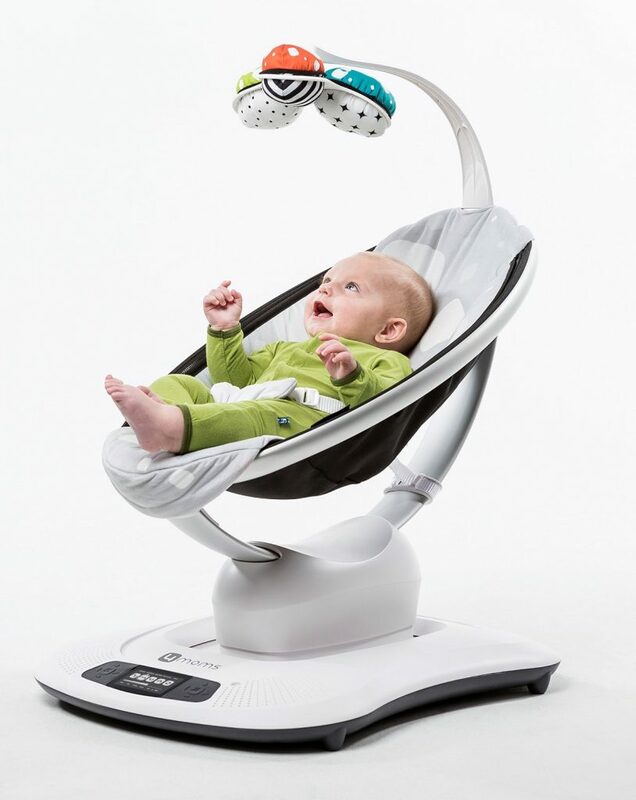 Kinetically-powered baby swing chairs are also available on the market. These rely on good old fashioned arm muscle power provided by the parents. The advantage is- some of them can be used from birth as a baby swing chair and then converted into a baby high chair up till adults chair. 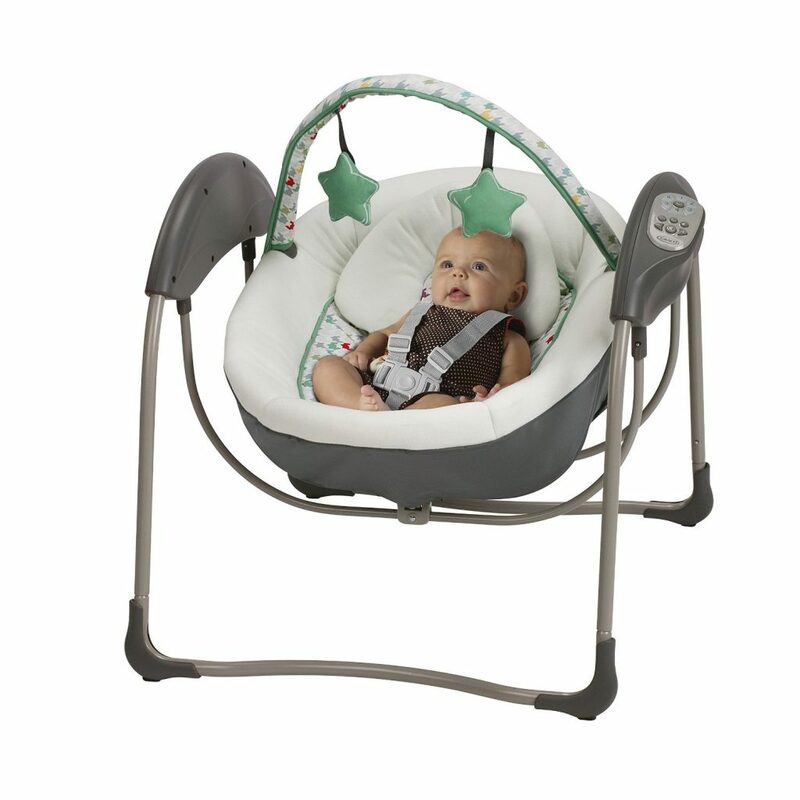 All baby swings, regardless of type, will come with a rigid or collapsible frame. Rigidity and the width of the stance are important considerations here. The wider the frame’s posts spread out, the less prone that the baby swing will be to any accidental tipping. For this reason. when other small children are present in the house, a wider or shorter frame is the best option to use. The design of the frame may or may not conclude a crossbar. Models without crossbars offer a greater ease in placing and moving the baby from the seat. Seat covers for baby swing chairs should be sufficiently thick for maximum comfort, but not so plush that a baby’s face could sink into it. The material should be machine washable. 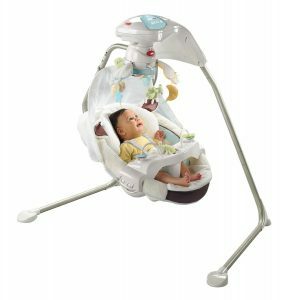 Special add-ons, such as a removable head support, make the swing chair usable from the newborn stage through early infancy. Variable speeds in the swinging motion of the chair is another feature that is offered on most swing chair models. Some on the market can have as many as eight different speed settings, while most will have only three to four. The greater the number of speeds, the more “age-resilient” that the swing chair will be for your baby. Newborns usually do not require anything beyond the slowest speed setting, but as the baby grows, some will require faster speeds to be soothed and comforted by the motion. A baby swing should have at minimum two seat positions, with three or four being preferable. The ability to adjust how far the seat reclines will allow you to find the most comfortable and soothing position for the baby. It will also accommodate a wider range of ages. Newborns require a far more reclined position than babies at six or eight months of age. Multiple seat positioning will make your baby comfortable throughout their different stages of development. When selecting a baby swing consider the variety of baby entertainment features that it offers. These can include something as simple as a hanging toy bar. It can also include a sound or music player. Some of these players only play a preloaded set of sounds and music. Higher-end models come equipped with MP3 players that the parents can load any MP3 file on, including their own voices, if that helps the baby relax and fall asleep. And baby swing chair with lights is also very popular. All baby swing chairs are required to have a restraining system. This is to prevent the baby from falling out of the chair. Full-sized baby swings usually come equipped with a five-point harness. This type of restraint system is considered the most secure. Portable and hybrid models may only come with three-point harnesses, although some models do offer the five-point option. With a better understanding of what the purpose of a baby swing chair is – its role as a baby care aid, and how it helps parents to comfort and soothe their babies – the need for one is clearly evident. The different types and features available should be given careful consideration as should the length of time that it will be used, usually from newborns until they reach six or eight months of age. This way, the baby swing chair selected will serve parents and baby well. As your baby grows into a toddler, you may think about buying a kids hanging chair – an excellent piece of furniture your child will enjoy over the years.